Flo's Review: Stephanie Perkins strength lies in writing imperfections. She writes these teenage boys who are...teenage boys. They make mistakes. They are quirky. They can be immature. But these faults make them real -- so real. And the quirkiness makes them loveable. You all know that Etienne St. Clair from Anna and the French Kiss is my second fictional crush, behind only Peeta Mellark from The Hunger Games. He is beautiful and flawed. 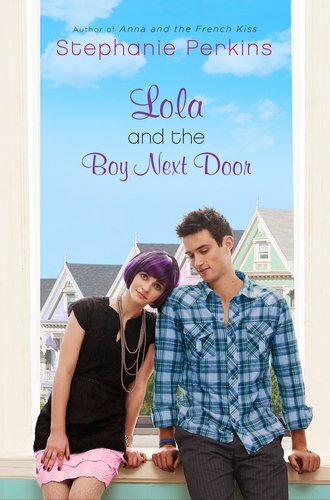 Lola herself is a great character to experience the story through. She has this crazy way of dressing and talking to the moon and other things that seem wacky, but are perfectly rational and explainable to Lola. My second favorite part of this book (behind Cricket -- have I gushed enough about him yet?!) are Anna and St. Clair. I knew that Lola was a companion book to Anna, and so they would be making an appearance. But I still may have squeed out loud the first time I recognized them in the book. And I didn't realize just how big a role they would have in Lola's story. LOVE!! The only reason Lola got 4 stars from me and Anna got 5 is because I loved Paris. Lola's San Francisco is bright and fun, but it can't hold a candle to falling in love in the City of Love. I will make a confession...Stephanie Perkins has done the impossible...she has me falling in love with a contempory boy..not once but twice now, she is really ruining my reputation as a lover of bad boys! Yes, I am talking about Cricket Graham Bell..he is the most dreamy of boys with his overly tall self, his messy dark hair, his skinny pants, his arm full of braclets and *sighs* that special star he keeps drawn on the back of his hand! As you can probably tell, I loved this book. I didn't mind that it didn't take place in a romantic place such as Paris, it could have taken place in my boring nondescript Midwestern neighborhood and I would have still loved it. Like Flo, I gave it a 4 star rating..mostly because for me..it took too many pages for Anna and St Clair to show up! Despite loving the fictional aspects of this well written story, the real life depictions of a girl being raised by two gay men, dating a tattooed older MAN who is a rock musician, having a drugged mother and homeless father, and dressing in costumes so that "she" isn't revealed, is messed-up. Psychologically and emotionally this girl is hurting and making bad choices that cannot just be summed-up to being a teenager. There is so much abnormal behavior going on here that apparently is intended to be understood as normal and maybe even healthy because it ends well. Hopefully, the YA crowd to whom this is directed will be able to see the pain and anger for what and who it really is and understand the improbability of this story ending with the "happily ever after" it seems to imply. As a work of fiction, this story is entertaining, as a work of true-life; it is heartbreaking. OMG - raised by gay men????? Oh no!!!! Give her back to her drug addict mother and homeless father at once!!! OMG, it's Breaking Dawn Day!! !